Do you come from a family of minimalists? Do you live under the stairs like Harry Potter? Do you simply want less stuff in your home? Your friends and family may feel the same way. Here's a handy list of gifts that won't gather dust. People spend a lot of time and thought assembling their gift lists. Respect that. A study by researchers at Southern Methodist University and the University of Texas at Austin found that when buying wedding gifts, the people closest to the bride and groom are the most likely to buy gifts off the registry in order to express their close relationship with the recipients. The same study also shows that gift recipients are less happy with unique gifts than if they had just received something from their registry. Why would you ever want to make anyone less happy? If you're one of these people trying to cut down on the clutter, lead by example and set up a gift registry for yourself. By sharing your wish list, you not only limit what comes into your house, but it makes it easy to casually ask what everyone in your life really wants. Years ago, when I was setting up my first apartment, I registered myself for wedding gifts at Williams-Sonoma. Back in the days before the Internet, no one used gift registries for single people. They just didn't exist. I had to use the wedding registry form at the store to create my apartment wish list. When I told my friends and family, most of them were mortified. A gift registry for a single girl? How unseemly! However, it was the first year that I got everything that I wanted for the holidays and my birthday. Moral of the story: Ignore the negsters and stick to your guns about your registry. Don't ask me how I know this, but gift cards are easy to lose in a messy house. I've lost conservatively a bazillion dollars in gift card and store credit value in my life. I have yet to lose one single paper currency gift. I can count on one hand the number of people I know who aren't completely overworked. While most people can't afford to give even themselves a needed vacation, a great night out can be just the break that people need to recharge. I love to take my friends out to lunch for their birthdays. Because many of my friends have super busy schedules, it's a great excuse to spend quality time with people I care about. I have friends who share their season tickets as their go-to gift. My friend Ellen buys two season tickets to the Hollywood Bowl each year. She then sends out the concert schedule to all of her friends so they can choose which show they want to see as her guest. My friend Ryan does the same thing with his season tickets to the Dodgers. My friend Andrew takes his friends and family to the Huntington Gardens for tours, museum events, and an occasional high tea. Sharing season tickets involves a lot of scheduling, but it's a gift that you get to enjoy with the recipients. As a bonus, this gift also benefits the organizations that you care about. A memorable day out doesn't have to be costly. Attend a free concert or set up a hiking date. Digital subscriptions to magazines and entertainment companies like Audible, Steam, and Netflix are great gifts for people who live in small spaces. In addition to taking up no physical space, digital subscriptions can provide hours of entertainment throughout the year. Looking beyond entertainment subscriptions, there are a variety of other services that run on a subscription model. Offer to pay for a year's subscription to reference sites like imdbPro or for digital tools like Adobe Photoshop. I just received a 23andMe DNA testing kit in the mail. It was sent anonymously, with the message "Happy Birthday" noted on the invoice. I texted my adopted sister; she is a big fan of the service. "Did you send me a DNA test?" "Hmmmmm, was it me or another mystery sister?" she texted back. We both agree that we're probably distant cousins on our Neanderthal side. If you can't afford the cost of a gift subscription, there is an excellent, cost-free option: Curate a list of free podcasts. My best friend spends a lot of time in the car for work. She is a rabid fan of podcasts for education and entertainment. This year she asked me if I would listen along with her to Witch, Please, a fortnightly podcast about the Harry Potter universe that is hosted by two potty-mouthed college professors. We spent an entire month listening to the podcasts and then debating important topics like whether the wizards, as described in the books, wear pants under their robes, and if puberty and Voldemort are equally evil forces. My parents believe that the two lasting gifts you can give your children are love and a good education. I think this is true. Education, like love, might not make you richer, but it will make your life more interesting. The gift can be as large as a college scholarship or as small as a single knitting class at your local craft store. Two of my friends have asked me to teach them how to make homemade sauerkraut as their Christmas present this year. If you take a class with someone you love, it can be a present for you, too. When my best friend and I were 13, we obsessively read every Agatha Christie mystery. We were less into the whodunit than we were the Downton Abbey-esque universe of Hercule Poirot and his friends. The transcontinental train rides, the Mah Jongg games, the constant tea drinking all seemed so glamorous. To celebrate the 20th anniversary of our friendship, we took a Mah Jongg class together, a game we still enjoy playing years later. Don't forget about online classes. Lynda.com has 4000 different courses in business, technology, and creative skills. Audible carries Pimsleur language courses at a discount. Donating to charity is a nice way to make friends feel remembered at the holidays and also spread the holiday cheer to people who need help. If you need help choosing a worthy cause, Charity Watch keeps a list of top-rated charities that spans a huge number of categories. In 2001, to address the Christmas elephant in the room — an elephant that we can't actually see because it's hidden under a pile of half-completed craft projects and books we intend to read very soon — my hoarder family took a radical step: We stopped giving Christmas gifts to each other. Even the kids. This is the nuclear option. But for families who can make the psychological jump, a No Gifts Christmas can totally change the way you feel about the holiday…for the better. For 15 straight years my family's No Gifts Christmas tradition has made the holiday season merrier for my relatives and me. There are countless ways to experience the spirit of the season that don't involve clutter. We have less stress and a lot more fun than when we had to shop for each other. Oh, and money. Did I mention we have a lot more money? And empty floor space. Empty floor space in my house is priceless. No one loves chores. That's why they are called chores instead of hobbies. Give the gift of time by helping your friends complete their own to-do lists. This year for my birthday my friend Señor Amor helped me hang curtains in my dining room. It was an all day ordeal. I can't imagine how long it would have taken me to do the job by myself. Every time I look at those drapes, I have a nice reminder of our friendship. My friend Crickett and I recently discussed our mutual hatred for filing. For our holiday gift to one another, we're going to help each other organize the piles of paperwork taking up precious real estate on our desks. If we have to suffer, at least we don't have to do it alone. Even minimalists have wish lists. If you don't mind ruining the surprise, just ask. Don't get me wrong; surprises are great. But who prefers to be surprised by a gift she doesn't want over something she's been pining to own? You cannot deny there is a certain satisfaction to getting exactly what you want. If your soul requires that every gift contain the element of surprise, then stake out your friends' Amazon wish list, Pinterest page, or Etsy favorites. Or, just be a good listener. 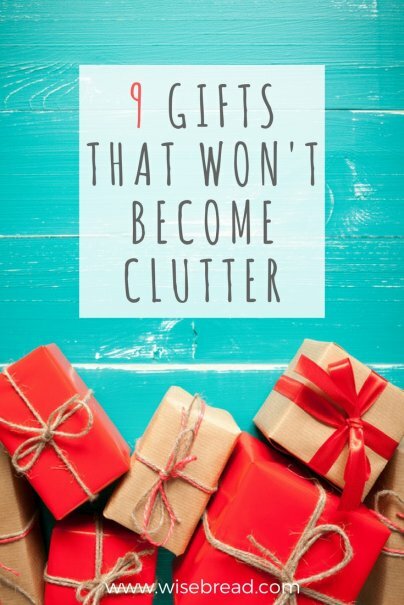 My friend Todd, a professional organizer who works with hoarders, is a master at choosing clutter-free gifts. He gives me two gigantic, 36-count packages of toilet paper from Costco every year for my birthday. Back when we were in college, I had mentioned to him that never having to buy toilet paper would be weirdly luxurious. Now, I don't remember saying this, but I do hate spending money on boring things like cleaning supplies. And, even if I never said it, can I tell you? Never buying your own toilet paper is luxurious. Great suggestions! Very well put together list. LOVE this list! I would appreciate anything listed here.